Starting in ancient time in Mexico to present day, the kitchen, Tita’s main dwelling, holds the heart of all culture and family ancestry, and Laura Esquivel’s novel Like Water for Chocolate is a prime example of this idea. Throughout the story, various recipes are woven into each chapter as a way of introducing new plot points, and to provide some insight into life during the Mexican revolution. The importance of Tita’s cherished recipes is summed up perfectly in the final scene of the movie and the novel. The scene takes place many years in the future, with the narrator finally being revealed. The narrator, Tita’s grandniece, tells the end of the forbidden love between Tita and Pedro, and then tells her own personal story starting from when her mother Esperanza died. Her dialog demonstrates specifically how without the recipes, the story of Tita’s life would have been lost forever. Tita and Esperanza are present in the kitchen with the narrator, Tita’s grandniece. This scene is at the end of the movie, when we realize that Tita’s true legacy is her recipe book, the last remaining part of the ranch. Tita’s legacy is the recipe book, and with each person who prepares her meals, a little piece of her becomes part of them. The tattered pages of Tita’s recipe book. 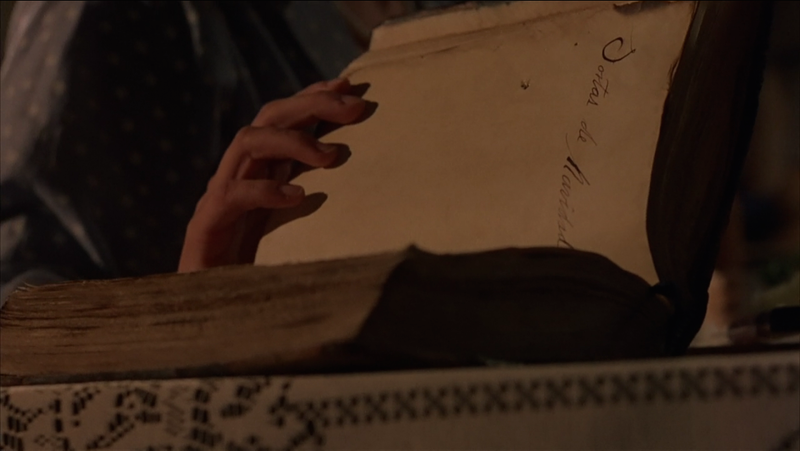 This shot is also at the end of the movie; the tattered pages are symbolic of how important and useful the book has been throughout Tita’s descendant’s lives. The life of Tita in revolutionary Mexico was stitched together with many different recipes. During this time in Mexican history, recipe books were passed down by generations of servants, and essentially Tita was Mama Elena’s servant for most of her life. In passing down the family recipes, the distinct flavors of Mexican dishes could be kept authentic. At the beginning of each chapter in Like Water for Chocolate, a different hand crafted recipe from Tita’s personal recipe book is featured that hints at the plot for that upcoming chapter. In the rose-petal quail chapter, the reader begins to suspect that this chapter will be based on subjects such as romance, and this actually is the case when Gertrudis runs off naked on horseback with a stranger. After this peculiar event, Tita records her memories of that day in her recipe book by saying, “Today while we were eating this dish, Gertrudis ran away.” By writing her own recipe book, she is able to record her experiences along with recipes. In this way Tita is not only preserving the tastes of Mexico, but also ensuring that whoever makes rose-petal quail or any other meal in the book will be perplexed by the stories contained in Tita’s writing. She is passing on her food along with her memories, hopes, and dreams. Set in revolutinary Mexico, this novel’s time period is quite explanatory of Tita’s cookbook; according to Pilcher, a food historian, many Mexican women began taking pride in their hand written cookbooks as a way of showing their culture and affluence . By cooking Tita’s favorite recipes, the food will connect those enjoying the dishes to a long-gone time when Tita worked so hard in the kitchen each and every day. This quote simply means that Tita wanted to share her highs and lows with others through the food she was making — specifically using the recipes behind the food. An example of the importance of the food can be found in the way Tita loved Christmas Rolls on her birthday because they reminded her of better times. Tita’s grand-niece is describing the way she feels when she makes Christmas rolls at the end of the movie. She shows how emotions can be wrapped up in food. Future recipe book users will enjoy Tita’s gift to the family: the chance to create new memories based around her foods. Tita’s spirit is a family heirloom in the sense that her cooking knowledge is passed on and on from generation to generation and gets more precious and fragile with each new progression. As soon as Esperanza find’s Tita’s cookbook amongst the rubble of the ranch, she begins using it and teaches her daughter, the narrator, the important lessons found within it. Thanks to Tita’s priceless handwritten recipe book, future generations can return to their roots and cook up the smells and tastes of the revolution in Mexico. Another example of Tita’s spirit as an heirloom is found in the way that the narrator describes Tita’s recipes as what keeps her living. As the recipes transcend through time, so does the spirit and memories of Great Aunt Tita, who will continue to transform lives for many more generations. Not only does food revive memories from the past, it also contains vivid emotions that are often hard to express. Tita (via her grandniece) describes her experience chopping onions as “the tears begin to well up, the next thing you know you just can’t stop” which shows just how vulnerable food can make someone’s emotions. Although the onions bring up the tears, once an outlet for emotions has been established sometimes it cannot be closed for quite some time. Tita pours her emotions into the wedding cake through a few tears, and her emotions continue to express themselves throughout the entirety of the mysterious vomiting and crying episode at Rosura’s wedding. 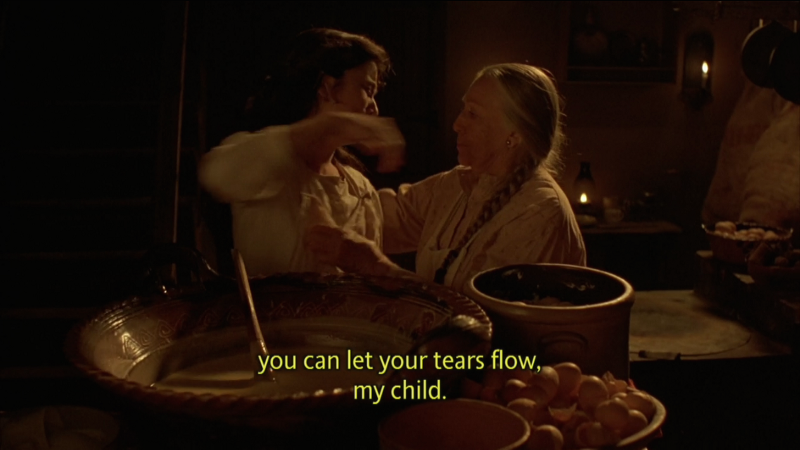 A screenshot of when Tita’s tears flow into the cake batter. Contained withing the precious family recipe book, Tita has given her future descendants the ability to express themselves and their heritage. The wedding cake will probably not cause a tremendous disaster like the last time, but it could be made with happiness or love and infuse those feelings into anyone who tastes it. Tita has passed on the ability to share emotions and understand emotions through food. According to Amerlinck, a cultural anthropologist, “The production, preparation, and consumption of food are related to practically every aspect of social life;” basically, what she is saying is that if this idea is applied to Like Water for Chocolate, Tita’s desire to pass on her whole life’s story along with her recipes becomes quite apparent. Throughout Tita’s entire story, one thing is for certain; her soul is intertwined with all the different aspects of food, kitchen life, and Mexican culture. Tita’s character grows and changes and she transforms from being someone who is tortured by her kitchen duties, to someone who is overcome by passion and love and enjoys her time feeding others. 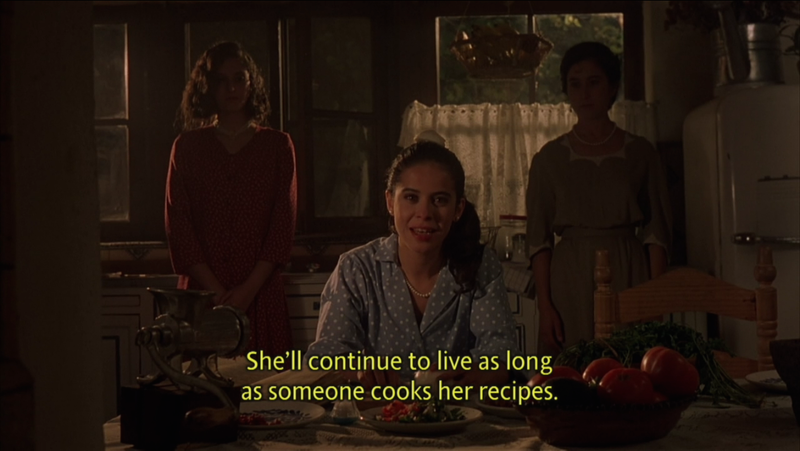 In the final scene of the movie, we see the narrator with Esperanza and Tita in the kitchen, which is quite symbolic of the idea that Tita lives on whenever people cook her food. Tita has passed her food and cooking heirloom on to her niece and great-niece who will continue to be present in the kitchen for all the food that has yet to be prepared from the family recipe book. Tita’s book ensures that her food and recipes are used as a way of keeping their family culture and memories alive, as a living household heirloom, and also as a scrapbook to preserve triumphs, tribulations, and emotions. Amerlinck, Mari-Jose. “Rice and Beans, a Staple on Even the Most Respectable Mexican Tables.” Rice and Beans: A Unique Dish in a Hundred Places. Ed. Richard Wilk and Livia Barbosa. Oxford: Berg Publishers, 2012. 219–233. Print. Como agua para Chocolate. Dir. Alfonso Arau. Miramax Films, 1992. Film. Esquivel, Laura. Like Water for Chocolate. New York: Anchor Books, 1992. Print. Pilcher, Jeffrey. “Tamales or Timbales: Cuisine and the Formation of Mexican National Identity, 1821–1911.” The Americas, Ed. Vol. 3 No. 2. Berkley: Academy of American Franciscan History, 1996. JSTOR. Web. 193–216. 11 September 2015. The family history of the Edmonds Family.